Ailanthus tree inoculated with wilt fungus. Note drooping and wilting foliage. Joanne Rebbeck, USDA Forest Service. Snapshot : Forest Service scientists are studying a North American fungus that selectively kills ailanthus trees. 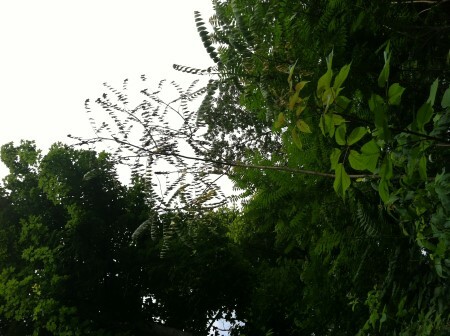 Test sites were selected in Ohio forests and trials will begin in spring 2015 to test the effectiveness of a soil-borne fungus on controlling Ailanthus. Ailanthus, a nonnative invasive tree from Asia, is a prolific sprouter that is difficult to control with herbicides or cutting. However, there may be an alternative control method in the near future. In 2002, Penn State researchers isolated the fungus Verticillium nonalfalfae from dead and dying ailanthus trees within forested areas of Pennsylvania. After rigorous testing and numerous trials, this soil-borne fungus was found to be very specific and deadly to ailanthus. In 2008, the same fungus was also found in Virginia and in 2012 Forest Service scientists isolated it Ohio. In 2013, they began greenhouse tests to verify that native tree species are not susceptible to the fungus. After two growing seasons, no signs of wilt have been observed in seedlings from native Ohio sources of ash, beech, elm, and oak (black, chestnut, northern red oak, and white). In summer 2014, forest sites were selected and plots were installed in preparation for inoculation trials to begin in spring 2015. Trials will test the effectiveness of the fungus in killing ailanthus as well as monitoring subsequent regeneration in areas once the ailanthus is eradicated. Restoration plantings of native tree species in these same forest sites are also planned.